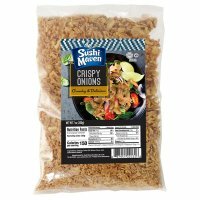 Crispy Onions 12 x 14.1oz [CRSPON] - $49.99 : SushiMaven.com, Your Source For Everything Sushi! Crispy Onions practically speak for themselves! The irresistible crunch makes it a go to item time and time again. Whether your making salads, side dishes, sushi rolls, soups, sandwiches, or anything else, make sure to have these handy, you'll be sure to use them!